(a) Install the air conditioning unit assembly with the 3 nuts. 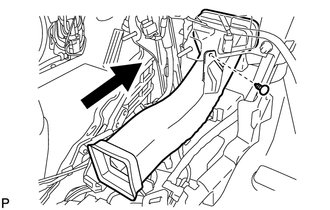 Tighten the nuts in the order shown in the illustration to install the air conditioning unit assembly. (1) Using a T40 "TORX" socket wrench, install the 2 "TORX" bolts. (1) Using a 12 mm hexagon wrench, install the 2 collars for adjustment. (2) Using a T40 "TORX" socket wrench, install the 2 "TORX" bolts. (1) Install the hole plug. (e) Install the 2 bolts to the engine compartment side. 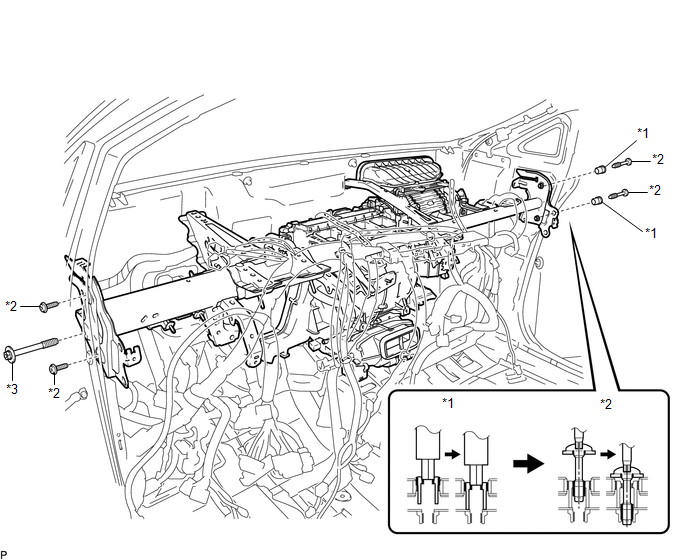 (f) Install the instrument panel reinforcement assembly with air conditioning unit assembly with the nut. (g) Connect the cooler drain hose. (i) Install the 2 nuts and screw. (k) Connect the blower motor connector. (b) Install the No. 2 instrument panel brace sub-assembly with the bolt and 2 nuts. (c) Connect the earth wire with the bolt. (b) Install the No. 1 instrument panel brace sub-assembly with the 2 bolts and 2 nuts. (a) Install the No. 3 instrument panel reinforcement with the 2 nuts. (b) Connect the earth wire with the bolt. (a) Engage the 4 claws to install the No. 6 heater to register duct assembly. (a) Install the No. 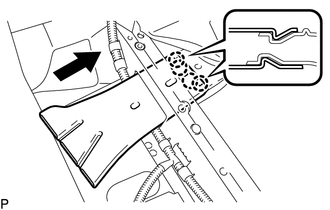 1 console box duct with the clip as shown in the illustration. (a) Install the floor carpet bracket LH with the 3 clips. (b) Engage the 2 clamps. (a) Engage the 2 claws to install the rear No. 1 air duct. (a) Engage the 4 claws to install the rear No. 2 air duct as shown in the illustration. (a) Install the floor carpet bracket RH with the 3 clips. 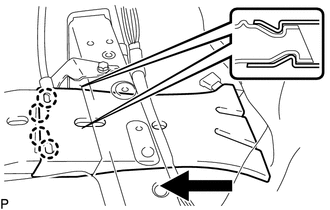 (a) Engage the 2 claws to install the rear No. 3 air duct. 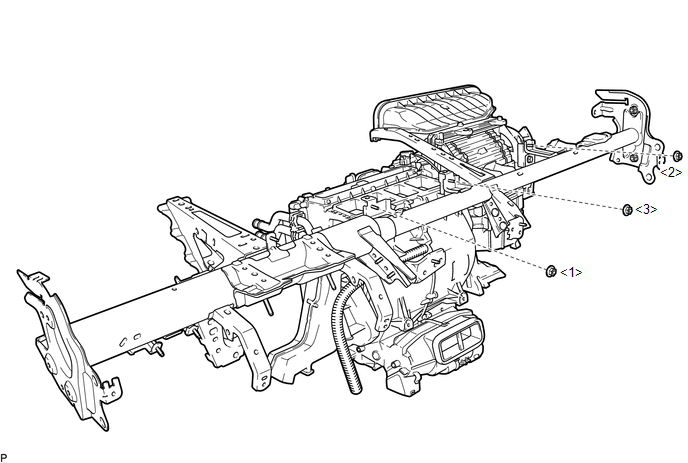 (a) Engage the 4 claws to install the rear No. 4 air duct as shown in the illustration. (a) Remove the attached vinyl tape from the pipe. (b) Sufficiently apply compressor oil to a new O-ring and fitting surface of the air conditioning tube and accessory assembly. (c) Install the O-ring on the air conditioning tube and accessory assembly. (d) Install the air conditioning tube and accessory assembly. (b) Sufficiently apply compressor oil to a new O-ring and the fitting surface of the suction hose sub-assembly. (c) Install the O-ring on the suction hose sub-assembly. (d) Install the suction hose sub-assembly. 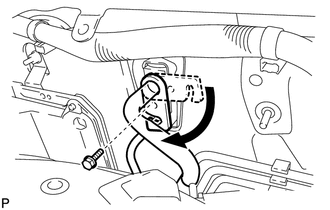 (e) Move the hook connector in the direction indicated by the arrow in the illustration. (f) Insert the pipe joint into the fitting hole securely and tighten the bolt. (a) Using pliers, grip the claws of the clip and slide the clip to connect the inlet heater water hose. (a) Using pliers, grip the claws of the clip and slide the clip to connect the outlet heater water hose. (d) Press the A/C OFF switch. (f) Enter the following menus: Body Electrical / Air Conditioner / Utility / Servomotor Initialization. (g) According to the Techstream display, select the "Next" switch. (h) According to the Techstream display, select the "Next" switch. During initialization, the AUTO indicator illuminates. When initialization is complete, the indicator turns off. (i) According to the Techstream display, select the exit to finish the initialization.